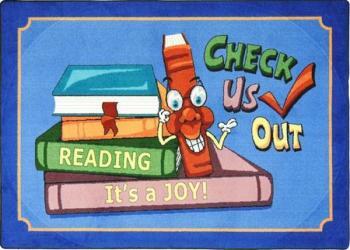 Size 3'10" x 5'4"5'4" x 7'8"7'8" x 10'9"
Classroom Area Rugs promote reading! Reading can be one of the trickier subject to teach your young students. Children of all ages, but especially those in preschool and kindergarten need positive reinforcement to continue with more difficult words and sentences. They also need a stimulating reading environment, which should include an interactive component. Writing words on a chalkboard and then reciting the words with your class can bore the most stimulated child. Try a different way of engaging your young students to read by ordering Classroom Area Rugs. 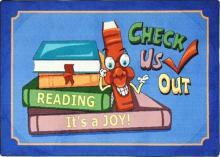 Our rugs brightly convey the positives of reading, with brightly colored books and an brilliantly designed bookworm that is guaranteed to catch your students' eyes. Once they look over our creative design, your student can comfortably sit on the durable Classroom Area Rugs for story time or a reading session. We construct our rugs with SoftFlex®, which is an air-texturized, polypropylene, secondary back that is the latest advancement in area rug backing systems. The rugs are designed to withstand the most demanding environments, including playful children who tend to spill drinks and track in mud from he playground. Our anti-stain and anti-soil treatments make cleaning Classroom Area Rugs as easy as a wipe with a damp cloth.